As well as the chocolate truffle slice recipe, Linda Helme, who runs the award-winning Old Bakery (a private restaurant with rooms), also sent us this more virtuous idea. This fruity, aromatic concoction is great on its own as a breakfast or brunch dish, but also melds beautifully with the truffle slice to make a stunning dessert. Put all the compote ingredients into a heavy-bottomed, non-corrodible saucepan or casserole dish. 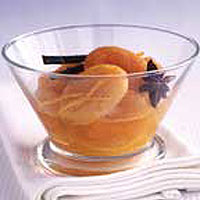 Bring the mixture quickly to the boil, then reduce the heat and simmer for about 15 minutes or until the apricots are plump and tender. Leave the mixture to cool, and serve at room temperature. This compote keeps well in the fridge for up to a week. Store it with the split vanilla pod and its flavour will continue to improve over time. It is delicious for breakfast (with or without the Grand Marnier), with cereals or with thick yogurt and a sprinkling of toasted pine nuts.